Terry Haws, chairman of the board of the theater stand is front of the stage at the Heritage Theater in Perry. You can go to New York’s Broadway theaters and lay down a wallet-load of money to see a live show, or you can go to Salt Lake City and see the show for about half the cash. 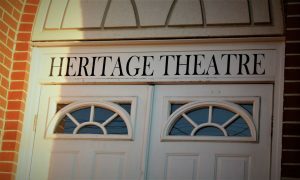 Heritage Theater, located at 2505 US-8 in Perry, has actors dedicated to their roles, but when they’re not on stage they all have day jobs. There are even some top shows in Logan, with professional actors giving great performances. But there is something about small town theaters doing live shows with volunteer actors that seems to attract audiences across the region. These actors all have day jobs, but have the bug to perform in their own town. They act in front of neighbors, friends and out-of-towners seeking an escape from everyday life. One of those small theaters is the Heritage Theater, located at 2505 US-8 in Perry. Their actors are dedicated to their roles, but when they’re not on stage the actors come from about any profession out there. Cast members have come from as far away as Provo to the south and Malad to the north. Some of their crew even come from Cache Valley. Actors and technicians that come for rehearsals and plays don’t get back until late at night. The building was built in 1890 by the Church of Jesus Christ of Latter-day Saints and served as a church for 80 years for the Perry Ward. 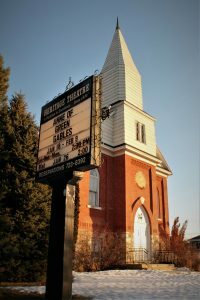 The exterior looks like a church, but the converted interior houses rehearsal space, scene shops, a business office and a 208 seat auditorium. The stage was the rostrum where the clergy conducted the meeting. It’s small, so the actors use aisles and the back, which is effective in including the audience in the production, said the Chairman of the Board. The floor is sloped so the stage can be easily seen. The gym in the basement has been converted to a scene shop and rehearsal space. The current price for adults is $12, seniors and kids are $10. There are sometimes specials during opening week, and mid-run there will be a special to kick it off. The building is a converted church constructed in 1890 by the Church of Jesus Christ of Latter-day Saints. The exterior looks like a church, but the converted interior houses rehearsal space, scene shops, a business office and a 208 seat auditorium. 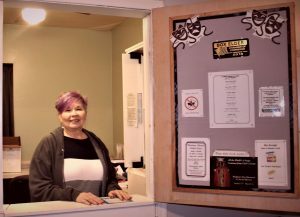 Holly Swapp, the press coordinator for the theater, said they are a nonprofit and just about all of what they do is through volunteers. The Board of Directors has been pushing to get the bathrooms more handicap accessible, they do have a chair lift. She said there are a network of actors, and once the theater community hears about a play, they keep each other informed on who is doing what play and where. Terry Haws, chairman of the board of the theater, said he is a typical engineering type, not a real outgoing guy, but after being on stage and feeling the rush of acting, he got addicted. Nancy Baker mans the ticket office at Heritage Theater Friday. The theater staff of about 35 members are securing grants to maintaining the grounds, it’s all done by volunteers. He has been with the Heritage Theater for about 10 years, after he was recruited by people at his church who knew he could sing. After the first time he said he was hooked.